A heartwarming and hilarious Christmas romance! In “A Winter Kiss on Rochester Mews” we’re back to Happy Ever After, the best romantic fiction bookshop in the world, and to the adjoining tearoom run by Mattie Smith, a very talented patisserie chef. She’s been running it for two years already, after coming back from Paris – heartbroken and disappointed and badly judged. This all happened around Christmas, so it’s not a wonder that she’s not the biggest fan of the festive season. Or men. Tom Greer still works in the bookshop, wearing cardigans with patches on the elbows, and the only thing that he has in common with Mattie is the fact that he also hates Christmas. Other than that, it seems that they rub each other only the wrong way. But after Nina moving out from the flat above the bookshop, Mattie and Tom become flatmates – how is it going to end? There are so many things happening in the bookstore and at the tearoom! Posy is heavily pregnant and ready to cry at any given moment, Nina is back at the shop and is determined to bring the festive atmosphere there, and so with the reindeers in their original size, mistletoe photo booth it slowly starts to look like “Christmas vomited over it”, which for Tom and Mattie, both total anti – Christmas, is at least one common ground to complain. This time the story focuses strongly on Tom, the enigmatic and enigma – like member of Happy Ever After team who hates romance, and Mattie, who always wears black, runs the tearooms by the bookshop and hates all man. Again, those two, as well as the rest of the gang, and they’re all mentioned in the book, hallelujah, they were just my kind of characters – believable in the way they were, with their ups and down, secrets and troubles, with days that were sometimes better and sometimes worse and their banter, and you know, it is often that you want to bang the characters heads together for them to see the light eventually – and I didn’t want to bang their heads together! They were simply brilliant as they were. Although, I must admit, there was a moment that I felt so sorry for Mattie, when she was blanked out by the others after revealing Tom’s secrets, and I mean, they all – Posy, Verity and Nina, all wanted to know them, right, and then Tom also blanking her out and it was just soooo unfair. I love how all the characters have their own stories to tell. Mattie’s heart was badly broken in the past and the return of her ex – boyfriend Steven doesn’t bode well. Tom, the very modern feminist, was so full of surprises and well, he always meant really well, even though it might not have looked like this at the first sight. The way those two were starting to find each other in this very complicated and uncomfortable arrangement of living in the same flat above the bookshop was absolutely sweet, hilarious and uplifting. Annie Darling, just like Debbie Johnson, can so brilliantly write about feelings and emotions, they’re so beautifully captured and they simply sound genuine and honest. I’ve finished reading this book grinning from ear to ear, there was so much joy and optimism here, it really made me feel better and lighter. It was a delight to read and it was almost as good as the first book in the series, “.The Little Bookshop of Lonely Hearts” though, to be honest again, it is probably one of the most gorgeous novels in the world and of all time. I really could read more about the Lonely Hearts Bookshop, it’s one of my absolutely favourite series, and I so hope to see more from the characters in the future, though guys, to be totally honest, the last sentence in this book looks like the very final one, sniff. Altogether, this book was a perfect read – I loved every single moment of it. It was full of fantastic characters that are down – to – earth and brilliantly funny and comic moments, but it also touched upon some heavier issues. There was the Christmas spirit, bookshop full of romance books and mouth – watering festive baking – I don’t need anything more! Highly recommended! Oh dear. Guys. 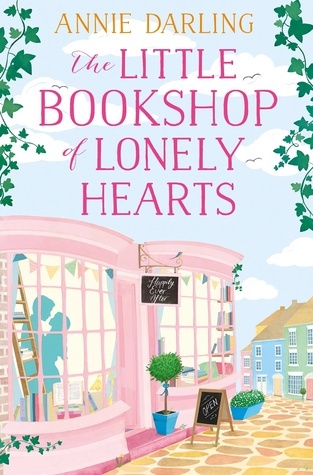 I’ve fallen in love with “True Love at the Lonely Hearts Bookshop” immediately – just like it happened when I’ve been reading the first book in the series “The Little Bookshop of Lonely Hearts” (and here you can read my review). Those two stories are heart – breakingly funny, warm, they tug at all the right heart strings and are full of the best ever comments, one – liners and characters. I could read Annie Darling’s books on daily basis. This book was a little different to the previous novel, although I can’t tell you exactly what was missing this time, maybe I just had too high expectations but still it was a brilliant, poignant and hilarious read. However, if you haven’t read the previous book, I would highly recommend to do this before reading Verity’s story, and not because you are going to miss on the characters or plot, because this book can be read as a stand – alone, but because the previous novel was just magical. Annie Darling has – again – created some of the best characters in the fictional world. This time the story focuses on Verity Love, who works in Posy’s bookshop. Verity may be a very extreme character – you know, there might be quiet and there might be quiet, and she was at the very end of the scale, but the descriptions of her introverted nature were so spot on, they explained her personality in such a perfect way that – even though I have my wild years behind me I am still an open person – I could just get Verity, I understood her with my whole heart and could see her need for peace and quiet. It was brilliant that she realised she’s not the easiest person to be around but it was even more great that she was trying hard not to overwhelm people with her need to be alone, and I had a feeling that she tried so hard not to be a burden – but she was not a martyr! Oh no. She was a lovely, incredibly smart and funny person and I would love to have Verity as a friend. I think that the best parts of the book involve Verity’s family – her fours sisters, cats, dog and parents who also refers to themselves as Our Vicar and Our Vicar’s Wife – loved it! The sisters couldn’t be more different than Verity herself and they brilliantly complemented her, they were incredible, self – confident chatterboxes talking all the time. I laughed out loud at their antics and couldn’t stop smiling when they were planning Con’s wedding. They were all so warm and you could see they love each other incredibly. The author also couldn’t come up with a better name for the antagonist. As it happens, I know one Marissa and even though she’s only a child, she’s as devil as the Marissa from the story. And then we have the main male character. Oh boy. But before I start gushing about Johnny please let me tell you that there was one moment at the end of the story when I felt SO disappointed with him! I thought I’m going to kill him with my bare hands. Also, him being in love with a woman he can’t have, and the way he cling desperately to this illusion started to annoy me at some point and I wanted to shake him really hard. And he was a little like enigma to me, sometimes he just came across as self centred and arrogant, and sometimes he was so understanding and heartfelt. But whatever, I really liked him and the way he was around Verity, he was so patient with her and he had so much understanding. What made me feel a little unsure was the fact that I was eventually asking myself if Verity and Johnny should really end up together? They worked brilliantly together in my opinion but there came a moment that we got to know Verity’s feelings about the situation and didn’t know about Johnny’s, and then came this another moment that I’ve mentioned above about being unsure about Johnny, and I was simply afraid that Verity is going to be hurt, because I was not sure what it really is what Johnny feels. Nevertheless, I loved the way this friendship evolved, it felt very genuine and natural. They both had issues and demons and I loved to see how they open up to each other and how it helped them. I am only afraid that slowly there is only so much Jane Austen I can take and that with this book I’ve maxed up my limit of reading books based on “Pride and Prejudice” – however it was one of the best “adaptations” I have come across. So altogether, even though the first book in the series was magically brilliant, I adored “True Love at the Lonely Hearts Bookshop” and I hope that Annie Darling is going to write another book about one of the characters! I will be the first in the virtual queue to read it, that’s for sure. This book was full of a great, different romance, wonderful, larger than life characters and written in such a lovely way! The author has a great way with words, she always knows when it’s time for something poignant or some fun and some of the situations are either heart – breaking or hilariously funny, and I loved this balance. If you need to loose yourself in a humorous, heart – warming novel about friendship, family, love and hope than treat yourself to this book. Highly recommended! Hi guys! It’s already June (even though it doesn’t feel like June, right, what with the weather!) and it is time for my Book of the Month, so here we go! It was easy – peasy this month, to be honest, as among all the brilliant books that I’ve read, there was one that just blew my mind away – it had all that I’m looking for in a book: it was full of warmth, INCREDIBLE humour, fantastic, vivid characters and it had one of the best plots ever, and well, it took place mostly in a bookshop! So, do you already know what book I’m talking about? Exactly! It’s the one and only „The Little Bookshop of Lonely Hearts” by Annie Darling and here you can read my review of this gorgeous, charming, heart – warming book! And if you scroll down, yours truly and the lovely Annie are chatting about the book! 1. How would your own bookshop look like? Would it be more Posy or Sebastian’s style? Not surprisingly I’m #TeamPosy all the way. Happy Ever After is the bookshop of my dreams. I love those bookshops, especially those second hand bookshops you always unearth in small towns when you’re on your hols, that are a warren of rooms all running into each other. Books arranged higgledy piggledy on the shelves. Comfy armchairs arranged here and there. The kind of bookshop that invites you to linger. And definitely either a resident bookshop dog or cat. 2. Do you believe in Happy Ever After? Kind of. Sort of. Alas, I see more evidence of Happy Ever Afters in books rather than real life. 3. What inspired you to write such a charming story as „The Little Bookshop of Lonely Hearts”? And where did the idea for this title come from? It originally started life as a standalone novel called Posy Morland’s Happy Ever After. I had this very clear idea of a slightly bumbling, dreamy girl who’d grown up on a diet of romance novels and who found real life quite disappointing by comparison and the story grew from there. So, when I originally submitted the novel the title had changed to The Little Bookshop of Happy Ever After but it turned out three other authors had written novels about bookshops and one, in particular, had a very similar title so there was a lot of headscratching and flip-charting until my editor, Martha, and I came up with The Little Bookshop Of Lonely Hearts. 4. Sebastian may have been „the rudest man in London” but I adored him – he is funny, with a great dose of sarcasm and he knows what he wants – is he totally fictional character or is he based on a real person (if so, could you please introduce us?)? 5. And Posy – one of the loveliest people in the world. How much of you is in Posy and how much of Posy is in you? What do Posy and I have in common? Permanently tangled hair, messy flat, too many books owned and too many biscuits eaten! We also have very vivid, some may say over-active, imaginations. 6. People are already loving „The Little Bookshop of Lonely Hearts” – what is the best thing you heard about your novel? It’s very early days as the ebook has only just come out, but I’ve been thrilled and quite blown away by the response so far, which has been really positive and so warm. I was worried that people might think I was poking fun at romance novels and their readers, so the best thing is that the readers of The Little Bookshop Of Lonely Hearts absolutely get that the book is coming from a place of love. 7. What was the best – and worst – thing about writing this story? The best thing was writing the scenes between Posy and Sebastian. The dialogue just snapped back and forth between them, such fun! And I also loved writing the Ravished By A Rake sections. The worst thing? There really wasn’t anything bad about the writing of The Little Bookshop Of Lonely Hearts. The words just poured out of me. 8. What did writing this book mean to you? What did you want your readers to take from this story? I wanted to represent for the romance novel and the readers of romance. I think so often we’re looked down on and dismissed because we’re not reading ‚proper’ literary novels. I believe all the great literature is about love and even if it wasn’t, it’s important to read what makes you happy. And what I want readers to take from this story is just a lovely warm feeling like they’re being hugged and a deep sigh of satisfaction when they read the four words that make up the final chapter.